Toxic dental materials have created much havoc in the dental profession, as well as in patient health, for nearly two centuries. Dental mercury fillings, nickel crowns (especially in children, called “chrome crowns”), root canals and cavitations have been the target of concern for a long time. The toxicity of root canals was disclosed by Mayo’s Clinic and Dr. Weston Price jointly back in about 1910. Close to a century ago. Price’s textbook on root canals, published in 1922, upset the dental associations at that time, and still does today. The American Dental Association (ADA), denies his findings and claims that they have proven root canals to be safe; however, no published data from the ADA is available to confirm this statement. Statements, but no actual research. My attention was drawn to the increase in autoimmune disease after the high-copper amalgams of 1975 were initiated as “state of the art” fillings, which ADA claimed released no mercury. On the contrary, studies from Europe1 found that the high-copper amalgams released fifty times more mercury than previous amalgam! In watching these changes regarding the onset of autoimmune disease, I noticed a blip in the statistics—an increase in amyotrophic lateral sclerosis (ALS or Lou Gehrig’s disease) in 1976 (See Figure 1). 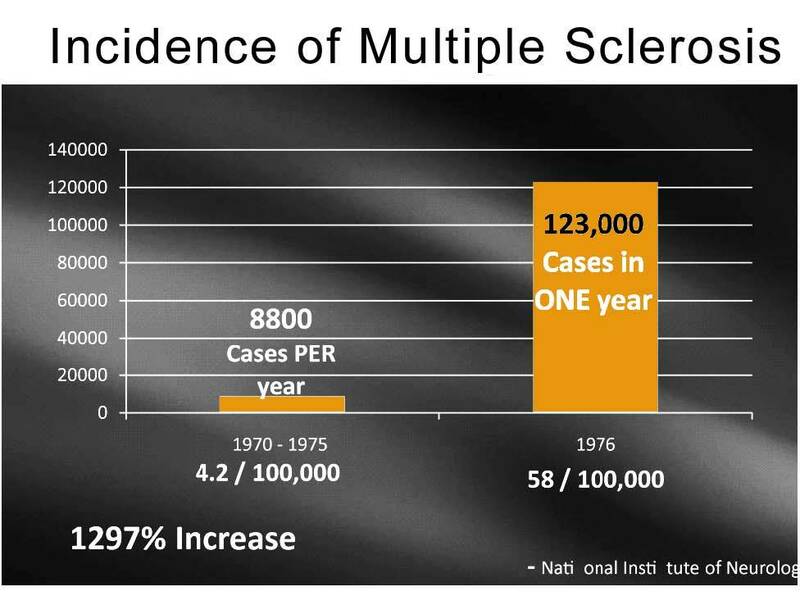 Note in Figure 2 that the actual number of cases of multiple sclerosis increased tremendously, from an average of 8800 per year during the period 1970 to 1975, to an increase of up to 123,000 in one year. That year being 1976, the birth date of high-copper amalgams. Is mercury the only dental hazard that can create conditions favorable to autoimmune diseases? No. There are bacteria in root canals that favor destruction of the nervous system and many other systems, resulting in the creation of autoimmune reactions. What is the common denominator? The formation of a hapten (see page 46). A hapten is a small molecule that can elicit an immune response only when attached to a large carrier such as a protein; the carrier may be one that also does not elicit an immune response by itself. In general, only large molecules, infectious agents, or insoluble foreign matter can elicit an immune response in the body. Healthy cells have a code imprinted on them. It is called the Major Histo-compatibility Complex (MHC). This is your personal code called “self.” Your body considers other code or alteration of this code to be “non-self.” The immune system is trained to kill and eliminate any “non-self” invaders. If an atom of mercury attaches to a normal healthy cell, a hapten is formed and the immune system immediately identifies that cell as “nonself.” The immune system then proceeds to kill the contaminated cell. If mercury attaches to a nerve cell, the result is a neurological disease, such as multiple sclerosis, Lou Gehrig’s disease, seizures or lupus. If mercury attaches to a binding site on a hormone, that endocrine function is altered. Mercury can attach to almost any cell in the body and create autoimmune diseases in those tissues. Lately, it has become evident that toxins from anaerobic bacteria have the same ability to create non-self autoimmune diseases by interfering with the MHC. This is the project that Dr. Price began to study a century ago. Resistance from organized dentistry was the same then as it is today. Price wondered why dentistry was considered a “health” profession. Price was concerned about the pathological bacteria found in nearly all root canal teeth of that time. He was able to transfer diseases harbored by humans from their extracted root canal teeth into rabbits by inserting a fragment of a root canal root under the skin in the belly area of a test rabbit. He found that root canal fragments from a person who had suffered a heart attack, when implanted into a rabbit, would cause a heart attack in the rabbit within a few weeks. Transference of heart disease could be accomplished 100 percent of the time. Some diseases transferred only 88 percent of the time, but the handwriting was on the wall. Dr. Price discovered that root canals had within them bacteria capable of producing many diseases. They had no place in the body. Which is more important? The life of the tooth or the life of the patient? This is still the primary argument facing us today. Considering the difficulty of culturing anaerobic bacteria, it was hard to identify them with 1920s technology. Most of the bacteria reported by organized dentistry at that time were aerobes of unknown significance. Today, with DNA analysis available, anaerobic bacteria (the dangerous kind) can be identified whether dead or alive by the presence of their tell tale DNA signatures. Let’s go back to the graphs of ALS up through the year 2000. Note an increase in 1976 and another increase in slope in 1991. In 1990, the dental association “suggested” that dentists perform thirty million root canals per year by the year 2000. Dentists accomplished that goal by 1999. As I understand it, the bar has now been raised to sixty million per year. The unexplained increase in MS (8800 to 123,000) coincided with the advent of high copper amalgams. The increase in ALS in the same year is suggestive of the same cause. ALS also increased in 1991 as more root canals were performed. Statistical coincidence? The goal of dentistry is to save teeth. Root canals allow dentists to maintain many teeth for years instead of extracting them. But is this goal appropriate considering the biological expense exposed with DNA research? What is more important? To save the life of the tooth or that of the patient? Dr. Price, while head of research for the now-defunct National Dental Association, took one thousand extracted teeth and reamed them out as dentists normally do, prior to filling the canals with wax. Price sterilized the canals with forty different chemicals far too toxic to be used in a live human situation; he wanted to see whether the canals could be permanently sterilized. After forty-eight hours, each tooth was broken apart, and cultured for the presence of bacteria. Nine hundred ninety out of one thousand cultured toxic bacteria just two days after treatment with chemicals designed to make the tooth sterile. Where did these bacteria come from? 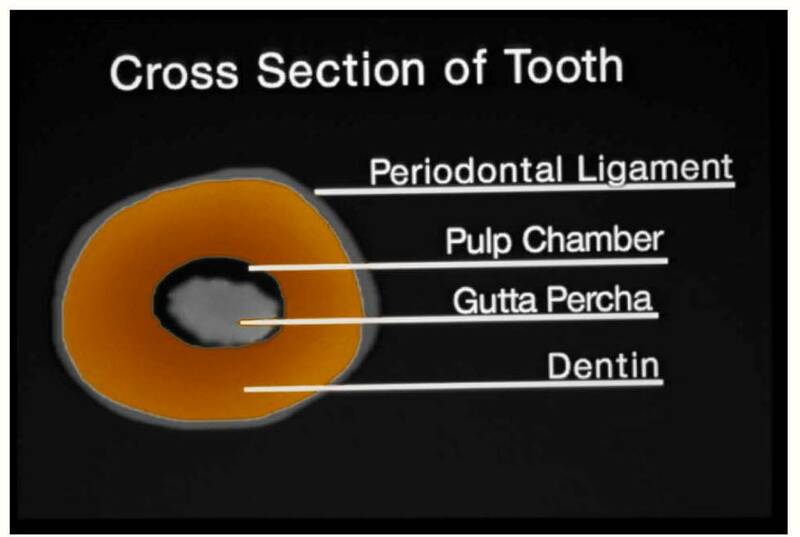 An overview of the structure of a tooth (see Figure 4) shows the outer layer, known as enamel, the second layer, known as dentin, and the inner portion, known as the pulp chamber, where the nerve lives. On the outside of the tooth is what is called the periodontal ligament. Teeth are not attached directly to bone. Fibers come out of the tooth and intertwine with fibers coming out of the bone, and they unite to form what is called the periodontal ligament. The second layer of the tooth, the dentin, is not really solid but composed of tiny dentinal tubules. In a front tooth, if all these tubules were attached end to end, they would reach over three miles.3Note that the tubules have adequate space to house many thousands of bacteria (see Figure 5). This is where the bacteria were hiding in the thousand teeth Price tested. From the dentin tubules, bacteria can migrate either into the pulp chamber, where space is left as the gutta percha—a natural form of rubber used to fill the space inside the cleaned-out root—shrinks upon cooling, rebounding from the force applied to push the wax down the canal, and losing the liquid portion (see Figure 6), or into the periodontal ligament where a plentiful supply of food awaits them. A tooth has one to four major canals. This fact is taught in dental school, but never mentioned are the additional “accessory canals.” Price identified as many as seventy-five separate accessory canals in a single central incisor (the front tooth). Figure 7 shows one of these canals filled with necrotic (dead) tissue. There is no way that any dental procedure can reach into these accessory canals and clean out the dead tissue. This necrotic tissue creates a home for multiple bacterial infections outside the tooth in the periodontal ligament. With added food supply from this area, the anaerobic bacteria can multiply and their toxins can contribute to the onset of disease (see Figure 8). Of course, the root apex (terminal end) is the primary area of concentration of infection. Even though this may be the last area to show infection, dentistry generally considers a tooth sterile unless areas of bone resorption show up on X-ray. Upon cooling and shrinking of the gutta percha, space is left at the apex in which bacteria can thrive, where neither white blood cells of the immune system, nor antibiotics can reach them. Of what significance are these? Four affect the heart, three the nerves, two the kidneys, two the brain and one the sinus cavities. Shouldn’t we question the wisdom of supplying a haven for these microbes so close to our brain and circulatory system? Does this information validate the claims of “sterile” root canals? Dentists claim they can “sterilize” the tooth before forcing the gutta percha wax down into the canal. Perhaps they can sterilize a column of air in the center of the tooth, but is that really where the problem is? Bacteria wandering out of the dentinal tubules is what Price was finding, and what we were finding in the crushed tooth samples. But does the problem end there? Hardly. Just out of curiosity, we tested blood samples adjacent to the removed teeth and analyzed them for the presence of anaerobic bacteria. Approximately 400 percent more bacteria were found in the blood surrounding the root canal tooth than were in the tooth itself. It seems that the tooth is the incubator. The periodontal ligament supplies more food, therefore higher concentration of bacteria. But the winner in pathological growth was in the bone surrounding the dead tooth. Looking at bacterial needs, there is a smorgasbord of bacterial nutrients present in the bone. This explains the tremendous increase in bacterial concentration in the blood surrounding the root canal tooth. Try sterilizing that volume of bone. Apparently, the immune system doesn’t care for dead substances, and just the presence of dead tissue will cause the system to launch an attack. Infection, plus the autoimmune rejection reaction, causes more bacteria to collect around the dead tissue. Every time a person with a root canal bites down, these bacteria are flushed into the blood stream, and they start looking for a new home. Chemotaxis, or the chemical attraction of a specific bacteria for a specific tissue, assists the anaerobes in finding new quarters in the heart, nervous system, kidney, brain, etc., where they will perform their primary damage. Many of the bacteria in the surrounding bone are present in far more than 50 percent of the samples tested. Streptococcus mutans was found in 92 percent of the blood samples. It can cause pneumonia, sinusitis, otitis media, meningitis and tooth decay. Streptococcus mitis was found 92 percent of the time. This microbe attacks the heart and red blood cells. It is a rather hearty bug, for it went to the moon (hiding in a camera) on an unmanned expedition, stayed there over two years in an environment without atmosphere, exposed to temperatures of 250 degrees Fahrenheit during the day, minus 250 in the shadow. Upon returning to Earth with the astronauts of Apollo 12, over two years later, this microbe was still alive.10 In humans, S. mitis binds to platelets and is involved in the pathogenesis of infective endocarditis. Want this guy living in your dead root canal tooth? Of the top eight bacteria in the blood adjacent to root canal teeth, five affect the heart, five the nervous system, two the kidney, two the liver, and one attacks the brain sinus, where they kill red blood cells Of these, Prevotella intermedia (present in 76 percent of the samples) attacks heart, kidney and sinus; Strep intermedius (present in 69 percent of the samples) attacks heart, nerves, lungs, liver and brain. DNA examination of extracted root canals has shown bacterial contamination in 100 percent of the samples tested. This is quite the opposite of official claims that root canals are 97 percent successful. Do they need a new definition of success? Cavitations are the next big problem that result from dental procedures. Cavitations are areas of unhealed bone left over after a tooth extraction (see Figure 9). Dentists are generally taught to remove a tooth and leave the periodontal ligament in the socket, a procedure which would be like delivering a baby and leaving the placenta in the uterus. These socket areas with the ligament left in place rarely heal. After tooth removal, a cap of about 2 millimeters (one sixteenth of an inch) covers the extraction site, leaving a hole the size of the root of the tooth behind. In records of five thousand surgical debridements (cleaning) of cavitations, only two were found to be healed.14 When the periodontal ligament is left in the bone, the body senses that the tooth is still there, and the order for healing is canceled. These holes are lined with many of the same bacteria found in root canal sockets, but actually more different species. Whereas root canal teeth contain up to fifty-three different species of bacteria, cavitations yield up to eighty-two of the eighty-three we test for. Candida albicans (present in 44 percent of the samples), in its yeast form is beneficial in the process of demethylation of methyl-mercury as well as its ability to destroy pathogenic bacteria in the intestinal tract. When converted into the fungal form by a shift in pH in the digestive system, candida can penetrate the intestinal wall, leaving microscopic holes that allow toxins, undigested food particles, bacteria and other yeasts to enter the blood stream. This condition is sometimes referred to as Leaky Gut Syndrome, which can lead to environmental intolerances. So, if all these diseases of “unknown etiology,” that is, of unknown origin, are the result of bacterial invasion, why not just flood the body with antibiotics? They kill bacteria, don’t they? Ever hear of someone who was sick, was given antibiotics, and then got even worse? Most of us have heard the story. Perhaps the following information explains what happens in these cases, and why antibiotics cannot be used in infections of this nature. Most antibiotics are “bactericidal”—think suicidal, or homicidal. Antibiotics kill. But this is not the same type of killing that John Wayne was noted for. When he fired at the bad guy, the bad guy fell over dead. Was then presumed to be buried. But when bactericidal antibiotics kill a bacterium, the bacterium explodes (see Figure 10). The fragments are not eliminated immediately, for each piece is a lipopolysaccharide called endotoxin.12 By way of contrast, exotoxins are the toxic chemicals that are released by pathogenic bacteria, and endotoxins are toxic entities (fragments of the original bacteria) that are the result of the bacterial explosion caused by the antibiotic. Endotoxins present a huge challenge to the immune system, for now, instead of facing one bacterium, it has to process and eliminate perhaps one hundred endotoxins. With dozens of bacteria to confront from each single root canal or cavitation, no one antibiotic can kill all of them, and if there were one, the resulting dead bacterial corpses would overwhelm the body and produce either greater disease or death. There are other ways to get these microbes under control, and several are being tested at this time. It is advantageous to have intravenous vitamin C and occasionally a non-killing antibiotic is added to this solution. This combination does reduce the challenge to the immune system, but, overall, root canals represent the rock-and-hard-place situation. Leave the root canal or cavitation in the body, and there is the potential of creating an unwanted autoimmune or degenerative disease that could be life threatening. Toxins and bacteria can both leak from these contamination sites wreaking havoc with a person’s cardiovascular, endocrine, nervous and immune systems. The public needs to be informed, so they can make educated choices in the trade-off between toxic convenience and health. Removing the offending tooth presents problems that must be confronted, or other problems can be induced—problems not as dangerous as the continuous bacterial spill, but ones that need to be avoided if possible. In order to allow the immune system to focus on healing, all other offending dental materials should be removed (mercury, copper, implants, tattoos and nickel crowns) so that the immune system can deal with the bacterial challenge instead of the bacteria plus toxic metals. Nutrition should be calculated from the aspect of the blood chemistries commensurate with one’s ancestral diet and in line with the dietary principles formulated by Dr. Price. Recovery from a root canal is complicated, but your patient’s life is worth salvaging. These studies in DNA analysis of bacteria in root canals and cavitations confirm the fact that Dr. Weston Price, despite being one century ahead of his colleagues, was absolutely correct in determining that bacteria-laden root canals have no place in the body of people interested in their health. This toxic waste spill can be stopped, but not with the assistance of dental associations, which continue to insist that the procedure of root canals is perfectly safe. The recent increase in suggested quota up to sixty million root canals per year is not in the best interest of their patients, nor can that action do anything but increase health costs for the innocent patient. Price was right. Root canals are not worth the price. A hapten is a small molecule that can elicit an immune response only when attached to a large carrier such as a protein or toxic metal such as mercury; the carrier may be one that also does not elicit an immune response by itself. In general, only large molecules, infectious agents, or insoluble foreign matter can elicit an immune response in the body. Once the body has generated antibodies to a hapten-carrier adduct, the small-molecule hapten may also be able to bind to the antibody, but it will usually not initiate an immune response; usually only the hapten-carrier adduct can do this. Let’s look at five major bacterial species lurking in root canals more closely, keeping in mind that these are only five of the fifty-three that are routinely found in root canal teeth. 1. Brune, D, Metal release from dental biomaterials, Biomaterials, Vol. 7, May 1986. 2. Steinman, RR, Leonora, J, Relationship of fluid transport through the dentin to the incidence of dental caries. J Dental Research, Vol. 50, No. 6, Nov-Dec 1971. 3. Price, WA, Dental Infections, Oral and Systemic, Vol. I, Penton Pub Co. Ohio, USA, 1923. 4. J. Clin Microbiology Vol. 45, No. 2 p. 645-647. 5. Apoptic cell death in PMNs, J. Infection and Immunology Vol. 68, No. 4, April 2000, p. 1893-1898. 6. Can Family Physician Vol. 53, No.9 Sept. 2007 p. 1451-1453. 7. J. Med Microbiology Vol. 56 2007 p. 1689-1691. 8. Anaerobe Vol. II Issue 6 Dec 2005 p. 350-353. 9. JSTOR: Clinical infectious diseases Vol. 25 Sept 1997 p. 5284-5286. 11. Archives of Internal Medicine Vol. 166 No. 5 Mar 13, 2006, PP 554-559. 12. Todar’s Online Textbook of Bacteriology, Kenneth Todar, PhD 2008. 13. Journal of Nutrition Vol. 130 p.4105-4145 – PubMed. 14. Personal communication, Dr. Blanche Grube. This entry was posted in Uncategorized on November 20, 2018 by The Health Coach.